Best Hairstyles for Fine Thin Hair with Bangs. Regardless of the haircut you go for, when you're the owner of fine thin hair, you'll need to make it obey you by putting into practice several rules. First of all, you should know that volume – or the lack of it - is the main problem of your fine thin hair. Therefore, whatever haircut you go for, and however you decide to style your locks, you'll need to find solutions to thicken fine hair. So, keep in mind that layers are some of your best friends when having fine thin hair, as well as volumizing products. And don't shy away from bangs. 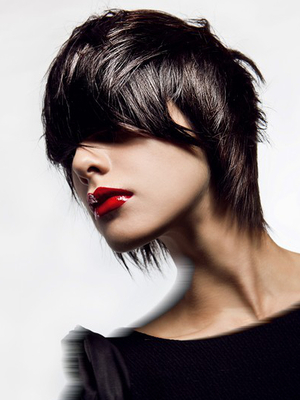 Hairstyles for fine thin hair with bangs are definitely your allies, and they can be styled in a myriad of ways. Be they long, medium or short hairstyles with bangs for thin hair, here are some of the best you should definitely try when your locks are on the limp side! 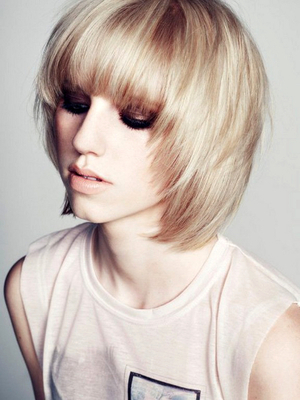 Some of the best hairstyles for fine thin hair with bangs include choppy layers, with side bangs and soft curls. Start by washing your fine thin hair with a volumizing shampoo and condition, then towel dry. Work a volumizing lotion into the roots - try Tigi Bed Head Superstar blowdry lotion, it really works - then apply a heat protecting product from root to tip. Blow dry your locks thoroughly, and then use a one inch barrel curling iron to style some beautiful, messy curls. To make your curls last, the finishing touch should be a healthy mist of volumizing hairspray. When it comes to side bangs for thin hair, just remember to style them with a round brush, and to even use the curling iron to give them more body. Always star with the bangs when blow-drying your hair and make sure to apply heat protectant to avoid frying your hair. When it comes to medium length hairstyles with bangs for thin hair, the previously described hairstyle should also fit like a glove. But another amazing option is a lob, or a long bob. If you have limp hair, forget about too much layering when going for a lob! 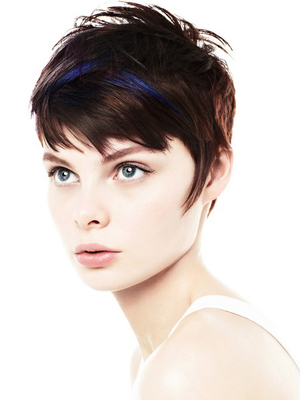 A one-length cut will make your locks seem thicker. To style it to perfection, even involving side bangs for thin hair, remember to apply volumizing products to damp hair, and to blow dry your lob with your hair upside down to encourage root lift. 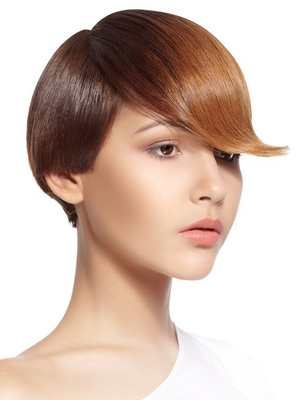 Stunning short hairstyles with bangs for thin hair include the pixie with side swept bangs. And it's as easy as pie to style! Simply blow dry your locks, and use a flat iron to straighten and define and piece out your bangs.